… cake & tea, what fun it will be ? … Who doesn’t wish that RL would be as easy as SL? I for one would love to redecorate my home as steady as I do it in SL. Quickly packed a few things back to my inventory, rezz new, and it all looks different! I really love backyards and small gardens which are lovingly moved in the right light. Since we moved we have a small backyard and I’m so in love with it ! Okay, if you come from northern Germany as I do, you must always have a contingency plan, so roofing or relocate everything quickly inside. Currently my SL home is quiet and peaceful, located in the middle of a forest. Let’s see how long it lasts. What kind of decorator are you? Are you rather be constant or erratic? 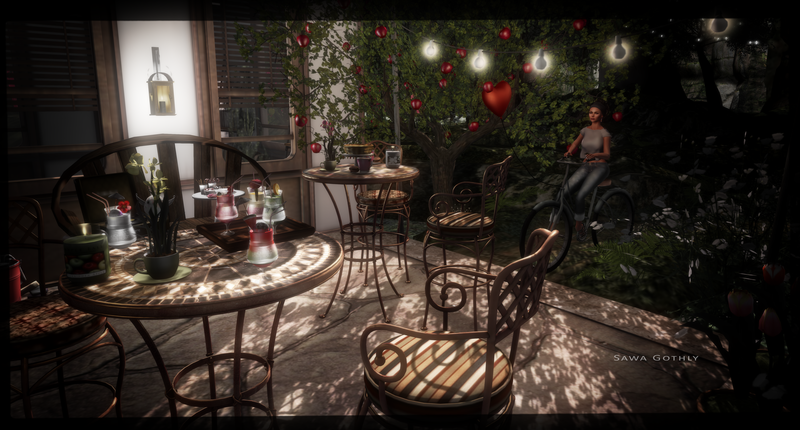 Dieser Beitrag wurde unter bloggies from Sawa, Events, I Heart SL, Interieur, Mesh, NEW, Sawa's Style abgelegt und mit Apple Fall, ARIA, DDD, LISP, Organica, Scarlet Creative, Second Spaces, Studio Skye, Trompe Loeil, vespertine verschlagwortet. Setze ein Lesezeichen auf den Permalink.